Pros: Visually stunning, unabashedly hilarious, and flawlessly performed by an excellent cast including world-famous Daniel Radcliffe. Cons: Whether due to direction or flow of the script, some scenes dragged and lacked the same energy as the production overall. Our Verdict: Another excellent and well-rounded production from Michael Grandage– a must see for theatre lovers and Radcliffe fanatics alike! Michael Grandage, Martin McDonagh, Daniel Radcliffe. I didn’t need any more information than the McDonagh, who recently churned out the successful and infinitely quotable films, In Bruges and Seven Psychopaths, offers an occasionally uncomfortably hilarious tale of a crippled teenage boy in 1934 Ireland. Orphaned “Cripple Billy’, portrayed by Radcliffe with sensitivity and gusto, lives his life limping to and from the doctor’s, staring at cows, being fussed over by his adoptive aunts and mocked by townspeople. When word comes that a film crew is visiting a nearby island and may hire some locals to return with them to Hollywood, Billy recognizes his opportunity to leave the endless monotony and pain behind. A darkly humorous portrait of Inishmaan and a thought-provoking comment on how we treat those less fortunate follows. Grandage’s production features a versatile rotating set constructed from water-beaten stones and never-quite-straight lines. It’s a barren environment, metaphorically complimenting the economic hardships of the community and also Billy’s sense of unfulfilment from his lack of human connection, family ties, and a fully functioning body. The crooked set is awe-inspiring, with its slanted walls, uneven mirrors, and the washed-ashore boat tipped dangerously. 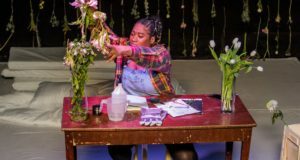 It’s a perfect example of the way in which the physical world of a play can so fully and organically reflect the tensions and thematics of the script. Lighting and sound make flawless additions to the rugged landscape– the lighting, particularly in a later scene created the most realistic early-morning sunrise I’ve seen staged. 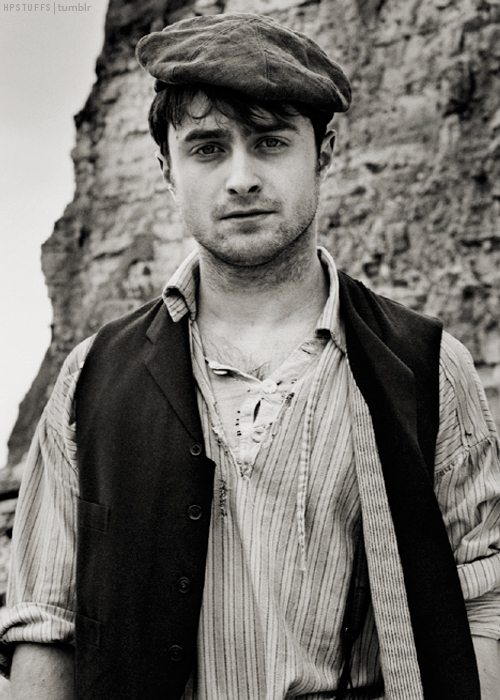 I admit Radcliffe was a major draw for me– though like I said, it was the creative team on a whole that represented a sort of Holy Grail of theatre genius to me. While I enjoyed the Harry Potter series and Radcliffe’s subsequent film and television appearances enormously, I must say to watch him live was a truly unique and transformative treat. He conquers Billy with compassion, humour, and immense drive. His commitment to the physicality – having chosen to portray Billy with cerebral palsy, as the source of his handicap is vague within the script – is phenomenal and effective. It’s a huge credit to him that within moments of his first appearance on-stage, I was completely unconcerned that I was seeing Harry Potter in the flesh, and rather found myself fully invested in Billy. 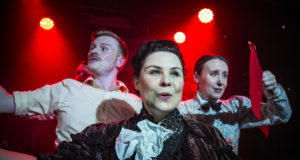 Radcliffe is supported by an outstanding cast; his fellow young cast-mates Sarah Greene and Conor MacNeill are more delightful to watch than I can possibly say, bringing a light-hearted and vibrant sense of humour. Gillian Hanna and Ingrid Craigie deserve mention for their portrayals of Billy’s deliciously odd aunts. There’s few complaints to offer, though I did find some scenes lagged while others were rampant with quick-witted remarks and resurfacing jokes. There were moments when I wondered if a segment was necessary at all, or where exactly it was leading. I never found myself fully satisfied in these instances. This could be a stylistic issue with McDonagh’s work, since I’ve had similar feelings about moments in his films. I do wonder if Grandage and his resourceful and talented cast couldn’t have worked out a way to maintain the sense of energy which resonates in most other scenes within these duller moments. A couple of yawns aside, I can’t recommend Cripple enough – Grandage’s new company has been turning out consistently great work this season, and only continues to do so. Radcliffe and McDonagh are a great pairing, and you’ll be sure to leave the theatre feeling like you’ve really escaped to Inishmaan. I’ll end with a quick recommendation to Radcliffe’s fans: don’t plan to see the show and wait in the Stage Door queue for a signing on the same night; you’ll never make it out soon enough to get a decent place in the mob. Or maybe just enjoy the fact you got to see an admirable young actor work, and go home so he can do the same thing. The guy’s had his arm crunched up for two and a half hours for a role, who wants to sign autographs after that?